Cottage gardens are romantic affairs, with blowsy perennials, free-wheeling self-seeders and rambling vines, all smothered in a confectionery of blooms. They're lovely, and my absolute favorite type of garden, but they have one caveat. They require structures. With all those rambling, flopping, winter-dormant, laissez-faire plants you want in a cottage garden, if you don't have structure, you have a big mess, plus nothing to look at through the off season. This is where the fence comes in. Garden structures such as fences provide lines, support, architectural interest, "bones" as we call them, defining and focusing the cottage garden. They often add to its utility, since at it's heart, the cottage garden springs from a history of utility, growing herbs, vegetables, fruits and medicinal plants all within a small plot. 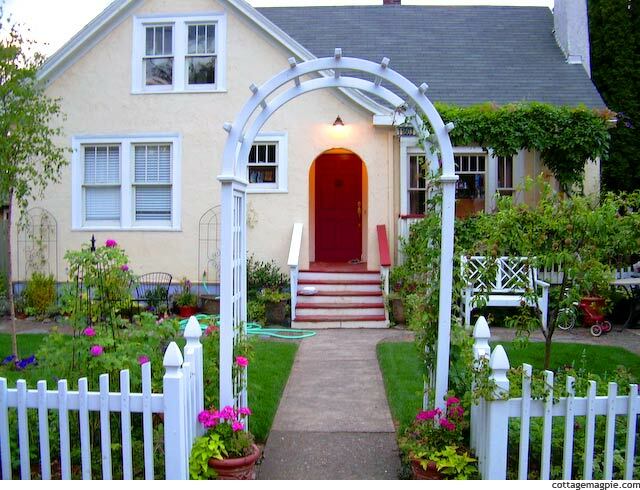 In the United States, the most familiar material is the classic wooden white picket fence. Whether painted or whitewashed, to many the picket fence is the epitome of the classic cottage garden. Which makes me wonder what the origin of the picket fence is. Wikipedia claims that picket fences have been used since the early 1600's in America. Today, picket fences can be used in sections, such as just on either side of a garden entryway to provide form and focus to the garden entry, or, picket fences can run the entire length of the garden bed or property boundary, corralling the tumultuous plantings. At Valentine Cottage, my previous semi-urban home, I installed white picket fences and arbors around the entire front garden. You might think that a picket fence is out of place in an urban settings, but even city dwellers appreciate the charm and reminder of more pastoral settings. White picket fences seem to evoke memories of a simpler time, with porch swings, fireflies and lemonade. A time when doors were left unlocked and people had time to grow and put up fruit or tomatoes in their Victory garden. 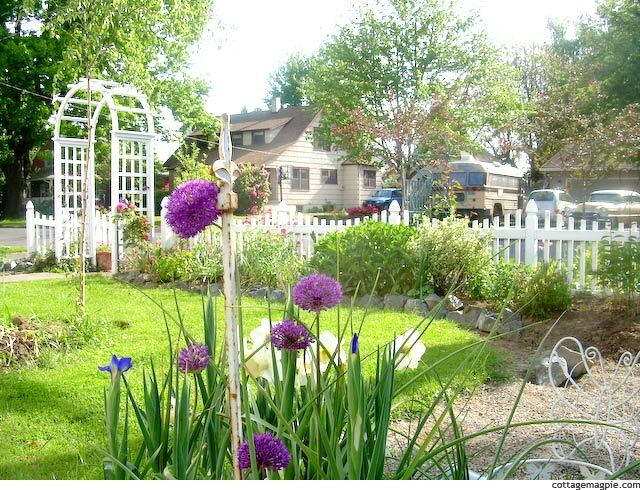 Whether urban or rural, the low front fence is a classic garden structure and a welcome part of any cottage garden. What about you? Do you have a picket fence in your garden? Linking up to the Gardening Gone Wild Garden Bloggers' Design Workshop for December: Fences and Walls.